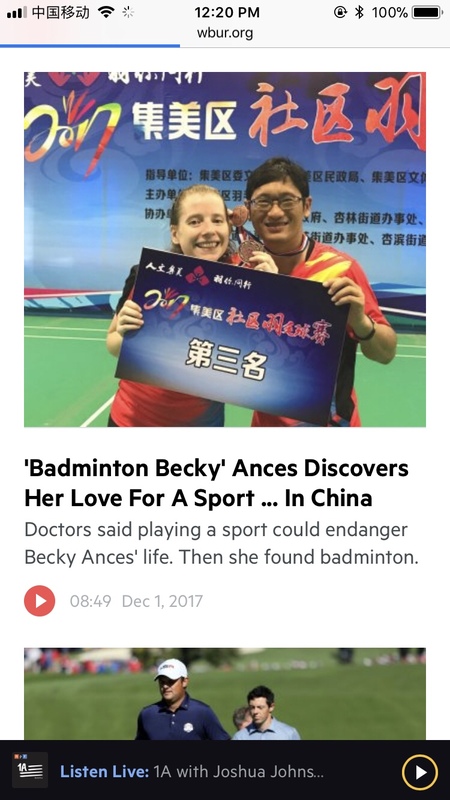 Badminton Becky Radio Interview on NPR’s Only a Game! I was interviewed for a segment on NPR’s Only a Game weekend radio show and it was broadcasted this weekend! For those of you non-American’s, NPR stands for National Public Radio. It’s broadcast nationwide and in many places, like my hometown in the hills of New Hampshire, it is the only radio station available. It’s commercial free radio, but with sponsors and fund drives because despite the name they get very little money from the federal government and need to support themselves. Anyway, I have been a big NPR fan for years, and it was the station usually playing in my car. Even in China I regularly download some of their shows (in podcasts). So it was a total shock and surprise when Kevin, the reporter reached out to me. He was just fishing for interesting news stories and found me by googling “Badminton changed my life.” We started e-mailing a few months ago and he kept me abreast of everything through pitching to final broadcast. I honestly didn’t know so much work went into an NPR segment. He went to Boston Badminton to talk to the owners and get audio of people playing badminton, and I also recorded some “Chinese street sounds” and badminton sounds to send to him just in case. As for our actual interview we did it over Skype. The computer quality wasn’t good enough so while we were speaking I recorded my end on my iphone 7 and after I sent him the audio files. A few weeks later he sent me some questions for my coach, and I went to the courts in the early morning when it was quiet to interview him. On their website they have pics of me and one with me and my coach. He was very excited. “Yeah,” he said. “But everyone is bad in the beginning. You have to take it step-by-step. But if you really try, and have a good coach, then you can.” Good answer and he was patting himself on the back with that “good coach” line. But I won’t take that away from him because that guy has the hardest job in the world being my coach, haha. He deserves the pat. Thanks so much to Only a Game and especially Kevin Ferguson who had to deal with the time change and stay up late to interview me and wait several hours for an email reply. If this interview accomplishes anything I hope a few Americans were inspired hearing of the sport of badminton, and decide to give it a try. That would be amazing. I found your blog through NPR’s podcast. 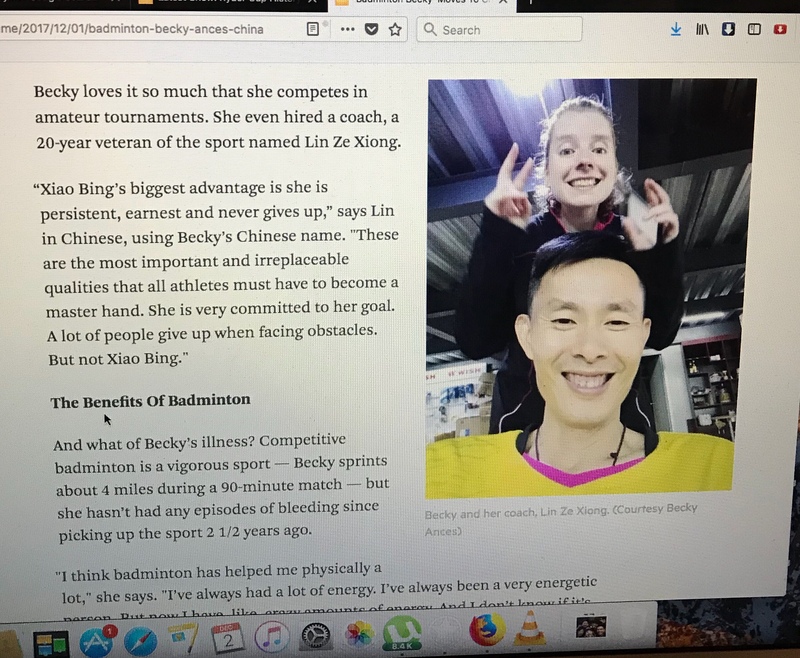 It’s been really interesting reading your posts and your perspective of badminton as a foreigner. I live in Toronto and have been playing badminton since high school (28 now) and I’ve never found a similar type of blog before (I’m really enjoying it!). Being in North America, badminton obviously isn’t as big as other sports but there is a sizable population here in the Greater Toronto Area that play badminton (you should definitely visit when you have the chance). I’ve always had to reinforce to others that badminton is not a casual backyard sport but one that is ultra competitive and highly skill based. Anyways, keep up the great work and looking forward to your continuing progress! Thanks so much! Toronto has a big Asian population right? And it seems that Canadians in general are a bit more respectful of badminton being a real sport (compared to Americans anyway). But keep on fighting the good fight of telling people it’s a competitive and serious sport. It’s a frustrating battle, but a worthy one.